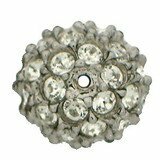 Welcome to Claspgarten, your specialist of high quality clasps and findings made in Germany ! Clearence of several magnetic acrylic clasps and cameos at fantastic prices to find in section Outlet items ! please read our button " Order Information " carefully.